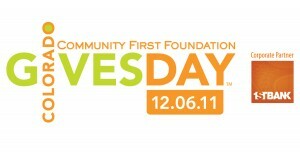 Tomorrow (December 6) is Community First Foundation‘s second annual Colorado Gives Day. This 24-hour event is a special opportunity to “give where you live.” Last year, Colorado Gives Day exceeded expectations and their $1 million fundraising goal by raising $8.4 million. In 2010, about 540 nonprofits participted and 83% acquired new donors. This year, all bets are off! There are over 900 participating nonprofits across the state. Corona Insights is pleased to see so many past clients and colleagues on the list: 9Health Fair, Bluff Lake Nature Center, Center for African American Health, Center for Work Education and Employment, Clinica Tepeyac, Colorado Youth at Risk, Denver Children’s Advocacy Center, Denver Public Schools Foundation, Family Tree, Metro Volunteers, Mile High United Way, Nurse-Family Partnerships, Qualistar Colorado, Rebuilding Together Metro Denver, Rocky Mountain PBS, The Children’s Museum of Denver, Volunteers for Outdoor Colorado, and Warren Village… just to name a few! Check out the Colorado Gives Day website to find your favorite nonprofit. Or, discover a new one to support! You have from midnight to midnight to contribute.